Note: You can enter this giveaway three (3) times per e-mail address per day. Deadline is 11:59PM ET 2.14.18. Maybe you’re familiar with croquet and croquettes and even have met the occasional coquette. Now allow us to introduce you to the cocotte – a covered casserole that can be used to both cook and serve food. 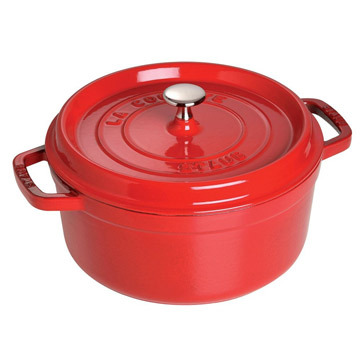 This particular cast-iron pot is from Staub and features a cherry-enameled exterior. It’s versatile and can be used for making Chicken in a Pot in the oven or Tofu with Summer Vegetables on the stovetop. Plus, it’s crafted to have equal heat distribution to eliminate hot spots so dishes turn out great every time and the lid helps retain moisture in food. The cocotte – also known as your go-to pot in the kitchen. NO PURCHASE NECESSARY TO ENTER OR WIN. Void where prohibited by law. Open to legal residents of the 50 U.S., D.C. and Canada (excluding Quebec) who are at least eighteen years old at the time of entry and have internet access. Begins on 12.19.17 at 12:00:00 a.m. ET and ends on 2.14.18 at 11:59:59 p.m. ET. To enter the giveaway, submit your full name and email address on this form. Odds of winning this giveaway depend on the total number of eligible entries received. Only three (3) entries per email address per day. Sponsored by Leite’s Culinaria, Inc. For more information, visit our Official Rules. For a list of winners, check out our Very Happy Winners page. Be sure to add giveaways@leitesculinaria.com to ensure notification if you are the winner.